This menorah was made by Lynn Rae Lowe, an award winning metal artist. 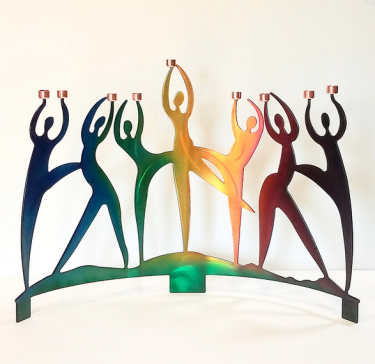 Using copper and steel, it is vivid with vibrant translucent rainbow colors and dancing figures. The Menorah is gently curved. Colors and design may vary in each piece. Measures 18"L X 5"W X 12"H.
Lynn Rae aspires to illuminate the Absolute by bringing the sacred into physical form and imbuing her art with an uplifting energy that the viewer can directly experience. A prolific sculptor working in bronze, aluminum, steel and paper. Lynn Rae has been listed in the Who's Who of American Women. She hails from the West coast of America and her work can be seen across America.